Rodney Hood had the ability to veto a trade this season, but was entirely on board with the deal that sent him from Cleveland to Portland, as he tells Alex Kennedy of HoopsHype. While Hood didn’t go so far as to say he got to “pick” his new team, he admitted that the veto ability gave him the power to maneuver his way to a club he wanted to join — like the Trail Blazers. Isaiah Thomas made his Nuggets debut, appearing in an NBA game for the first time since last March. Christopher Dempsey of Nuggets.com has a Q&A with Thomas about his long road back from hip surgery, Nick Kosmider of The Athletic relays the point guard’s impressions of his return, and Harrison Wind of BSNDenver.com examines how Thomas impacted the team even when he wasn’t playing. The Thunder, who dipped to 12 players this month, are back up to 14 after signing Scotty Hopson and Richard Solomon to 10-day contracts, but they may just be short-term options. Erik Horne of The Oklahoman explores other ways in which the Thunder could use their open roster spots down the stretch. FEBRUARY 4: The trade is now official, according to press releases issued by the Blazers and Cavs. According to Cleveland’s announcement, the two picks included in the deal are Portland’s own 2021 and 2023 second-rounders. The Cavs also confirmed they waived Simmons from his 10-day contract to clear the necessary roster spot. “Rodney is an accomplished NBA player that brings versatility, shot making and depth to our perimeter and will fit seamlessly into our culture and style of play,” Blazers president of basketball operations Neil Olshey said in a statement. 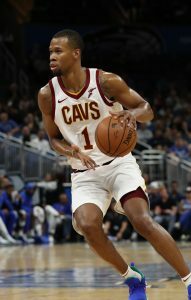 FEBRUARY 3: The Cavaliers are trading guard Rodney Hood to the Trail Blazers for Nik Stauskas, Wade Baldwin and two future second-round picks, Adrian Wojnarowski of ESPN reports. The Cavs must release one player to make the trade work, with 10-day contract guard Kobi Simmons being a potential candidate. Cleveland will continue to explore the market for Alec Burks, who could be on deck for a trade, Wojnarowski adds. J.R. Smith also remains on the roster several weeks after he and the team mutually agreed to part ways. Hood, 26, had to approve of the trade because he signed a one-year qualifying offer last offseason, as noted by Wojnarowski. He was enthusiastic enough about joining the Blazers to waive his Bird Rights, now focused on helping Portland advance as the postseason nears. For Portland, Hood is expected to provide bench scoring behind the likes of Damian Lillard and CJ McCollum, currently holding per-game averages of 12.2 points, 2.5 rebounds and two assists. He’ll be a free agent on July 1. The Blazers (fourth in the West at 32-20) also freed up a roster spot with the agreement. Stauskas and Baldwin join the Cavaliers as two younger guards who will enter unrestricted free agency this July. Baldwin struggled shooting the ball (30% from the floor and 22% from 3-point range) in limited minutes with the Blazers this year, while Stauskas has shot a career-best 42% from the floor and pedestrian 34% from deep on the season. With the trade, Cleveland has essentially turned Hood, Kyle Korver, George Hill and Sam Dekker into one first-round pick and six second-round picks for the future, ESPN’s Bobby Marks tweets. The first round pick is protected in 2021. The NBA’s annual trading deadline falls on Thursday, February 7 this year. Today’s deal between the Cavaliers and Blazers is the 10th different trade of the 2018/19 season. 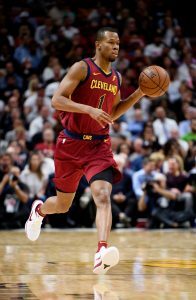 After being traded from Utah to Cleveland during the 2017/18 season, Rodney Hood could once again find himself as the subject of in-season trade rumors in 2018/19, writes Chris Fedor of Cleveland.com. However, this time around, Hood is vowing not to let that speculation affect him. While the Cavaliers set aside some money last offseason to re-sign Hood to a long-term deal, he ultimately accepted his one-year qualifying offer, and not it’s unclear whether he’s still part of the club’s future plans. ESPN’s Brian Windhorst recently identified Hood, an unrestricted free agent in 2019, as a player who could be on the trade block in Cleveland. Of course, there’s another notable difference between last year and this year for Hood — because he re-signed with the Cavs on a one-year deal, he has the ability to block any trade that involves him. “I didn’t know that until actually about like three or four days ago when people started talking about it,” Hood said. With Cleveland headed for a high spot in the draft lottery, Hood may welcome a change of scenery if he gets a chance to join a contender. Still, the Cavs will have to take his veto ability into account as they explore the market, since they’ll need him to sign off on any trade agreement they make. As Fedor details, Hood isn’t going into specifics on whether or not he’d approve a deal, but did say he’s happy in Cleveland. While the Clippers haven’t explicitly expressed interest in Rodney Hood, they’ve scouted the Cavs’ last several games, could use a wing, and don’t want to take on multiyear money, writes Joe Vardon of The Athletic. Those factors could make L.A. an ideal suitor for Hood. The Cavaliers just acquired John Henson earlier this month, but it’s possible he’ll be on the move again before the trade deadline, says Steve Kyler of Basketball Insiders. As Kyler notes, Henson could return from wrist surgery in February and isn’t in Cleveland’s long-term plans. However, if he’s still not healthy at the deadline, the Cavs may have a hard time finding a taker, especially since his $10.48MM salary for 2019/20 is fully guaranteed. Although the Cavs have been willing to listen to inquires on Kevin Love, league sources view an in-season deal as unlikely, according to Kyler. By all accounts, Cleveland won’t be actively looking to move Love anyway, but if that stance changes, an offseason trade appears more realistic, as his contract would be easier to move at that point. The Pelicans, Pistons, and Kings have been among the most active teams calling around in search of potential upgrades to their respective rosters, league executives tell ESPN’s Brian Windhorst. As Windhorst notes, those three clubs are expected to be among the NBA’s buyers leading up to this season’s trade deadline. New Orleans and Detroit are both in win-now mode, and have shown a willingness in recent years to move first-round picks for immediate upgrades. Anthony Davis‘ uncertain future will motivate the Pelicans to be one of the most aggressive teams on this season’s trade market, and Pistons owner Tom Gores badly wants to see his team back in the postseason, as Windhorst explains. As for the Kings, this is the second time this week that Windhorst has talked about them being potential buyers. Sacramento, which has traded away its 2019 first-round pick and has no incentive to tank, has exceeded expectations this year and is currently in the hunt for a playoff spot. Plus, the Kings are the only NBA team currently under the cap, and their $11MM in room could open up additional trade opportunities. On the other end of the spectrum, the Cavaliers remain the NBA’s most noteworthy seller on the trade market, according to Windhorst. Even after moving Kyle Korver and George Hill, Cleveland may continue to be active — J.R. Smith is a prime trade candidate, and even Rodney Hood and Alec Burks could be on the block, Windhorst adds. Although Hood and Burks are both in contract years, there would be some complications if the Cavs want to move either of them. Hood doesn’t become trade-eligible until January 15 and has the ability to veto any deal, while Burks can’t be aggregated with any other players until January 29. Following up on conflicting reports about the Pistons‘ apparent interest in Damyean Dotson, Stefan Bondy of The New York Daily News confirms (via Twitter) that Detroit has expressed interest in trading for the Knicks‘ swingman. It’s not clear how enthusiastic New York would be about moving Dotson, but both the Pistons and Nets have been linked to him within the last couple weeks. While the Pistons could use a little more stability on the wing, Bondy’s report, which noted that Luke Kennard hadn’t yet found a fit in Dwane Casey‘s system, came just hours before Kennard went off for a career-high 28 points on Monday night. If the 2017 lottery pick can get it going, Detroit’s need for reinforcements figures to be less urgent. Indiana has turned Victor Oladipo‘s absence into a positive, with several Pacers playing their best ball of the season while Oladipo has been sidelined, writes Gregg Doyel of The Indianapolis Star. With Oladipo on the verge of returning, the Pacers will certainly be happy to welcome him back, but they’ll need to make some tweaks to their rotation to accommodate him, says Mark Montieth of Pacers.com. Rodney Hood and Alec Burks were traded from the Jazz to the Cavaliers in separate deals, with Donovan Mitchell‘s emergence in Utah playing a major part in the change in their career paths. Joe Vardon of The Athletic spoke to both Hood and Burks about adjusting to Cleveland and what comes next for them.